You must follow the Current Affairs Update and Current Affairs Articles from Achiever's Rule as it is beneficial for your preparation for the upcoming Govt exams. 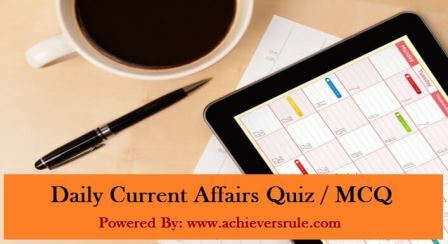 Practice regularly the Daily Current Affairs MCQ/Quiz and complete your preparation. Download the PDFs. Q1.Who has won the South Australian Open Squash Title ? Q2.In which of India, the International Aviation Security Seminar is organized ? Q3.Which Indian batsman recently breaks the record of Most hundreds in chases ? Q4.Who is appointed as the Goodwill Ambassador for Autism ? Q5.Which country has launched 'Grand Trunk Road' project ? Q6.Which sports personality has received 'Coach of the Year' award ? Q7.Which company has received the PM's Trophy for being best performing integrated steel plant ? Q8.Who has received the Highest Civilian Award of Australia for Community Work ? Q9.Which of the following is the first World Heritage City of India ? Q10.Who has launched the Swayam digital scheme to host courses taught in classrooms from class 9th to post Graduation ? Q11.The Forensic Science Lab of which state has introduced a portable Beef Detection Kit ? Q12.Nepal has signed an agreement to set up a Border Law Enforcement Center with which country ? Q13.in which Indian city, the first Maize based Mega Food Park will be developed ? Q14.Who has won gold in Steeplechase in 2017 Asian Athletics Championship ? Q15.In which Indian city Oracle has opened its first Digital Hub ?